A wet room is a stylish contemporary addition to any bathroom allowing endless design possibilities with freedom in size, shape and layout. This, combined with wall hung sanitary-ware and bathroom furniture, creates the feeling of a large open area providing you with a luxurious, visually stimulating space. Level access entry ensures accessibility for your whole family, regardless of age. 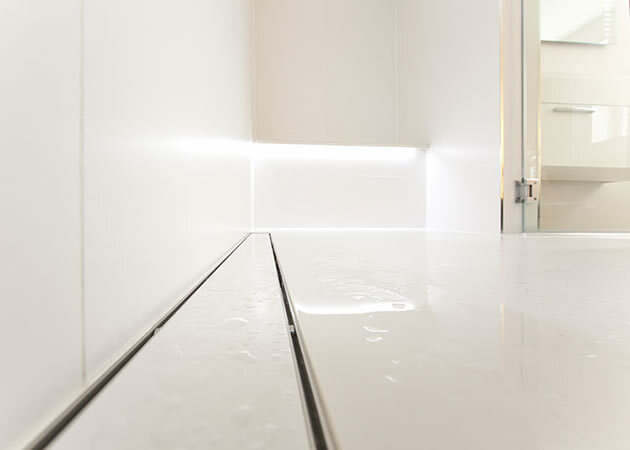 We always introduce innovative features into our designs including essential storage solutions incorporating LED accent lighting in shower area alcoves, under floor heating, recessed towel rails and fibre optic ceiling lighting. Linear drainage with a two way gradient allows large format tiles to be used creating symmetry and seamless fusion between the wall and floor. Recessed ceiling speakers give you the opportunity to enjoy music from your ipod or smart phone via wireless connectivity. Copyright © Thames West Bathrooms 2013–16. All rights reserved.